It's taken me a while to get to my blog as I came home inspired to work, which is probably the best recommendation I could give for a weekend quilting retreat. Still it wasn't the only thing that made the weekend a great experience. I have to admit I was a little wary about going to teach at a retreat. In my experience retreats (and actually most bookings, but shorter ones are less tricky) come in two types, very basic and absolute luxury. Until you've been there you have no idea which one you are going to be faced with, so the first time I go armed for every bear. Fortunately this turned out to be one of the ones where I got spoilt rotten. Hobby Holidays is actually very easy to find. I wasn't sure when I looked at the maps, but it really was straightforward. I did feel a little foolish when I got very close to the venue. I realised I couldn't remember the specific address. I stopped to look it up, got out of the car and then saw the huge banner. Doh! I was right outside. The main house where the guest rooms are located is a listed building, and absolutely wonderful in my eyes. It is also cool even in the quite hot weather we had this weekend. There is a coachouse next to then main building housing the purpose built workshop which you can see in the picture. It's a nice bright room and they supply lamps for each of the tables. It's one of the features I find really handy at Patchwork Corner where I teach regularly, and surprisingly rare given how helpful they can be. The class I taught was a very free form machine quilting workshop. Although we started with the absolute basics the students all moved on very quickly. I love it when students take a new technique and really go for it. Two of the students worked on freehand quilting projects they had brought with them. Another one completed a small whole cloth, and we got to plan quilting for another project. Frustratingly I forgot to take any pictures of their work. I am hoping they might read this and post it on their blogs (please pretty please :) As well as the time spent in the classroom we had a the chance to chat over the 'light lunch'. When Jo and Phil say light lunch they don't mean it. They do hospitality in a big way. It's amazing how much more you information you can pass on when you can relax away from the machines for a while. It's not something I've noticed at other retreats, I think because the classes often disperse at meal times. With only one class at a time this doesn't happen so you learn more and bond better. In the evenings, after the wonderful evening meals which are available for all the staying guests, I got to go and and look at the local wildlife. It's been a very long tie since I last saw an owl, and they are even more beautiful than I remembered. They are quite eerie as they fly, silent flying is just weird. I didn't think to take my proper camera, but if I go back I certainly will. I hope I will get invited back as a tutor, I really enjoyed teaching there, but if not I can see me going back as a student. Oh and if sewing workshops are not your thing then they also offer model railway weekends. As you might expect I took advantage of the shopping opportunity. I was quite restrained, but I suspect I will have to make use of their online shop at some point. I didn't buy any of the oriental fabrics at all, and I am starting to regret that already. I also bought some very strong magnets. I think they are officially for the train people but they have a lot of uses for sewers too. I am planning on making some name badges with them as they fastening so I don't have to put holes in my expensive t-shirts and they are good for picking up spilt pins too. You might have noticed the wholecloth winner. A small white quilt with a lot of featehrs on it? 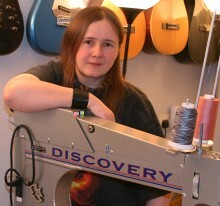 It was made by Sally (who you can see collecting her awards at her blog). A while ag she and I decided we would make each other a quilt. Being a bit more organised than me she has finsihed my one and on Sunday I was presented with not one, but two little quilts. One of them even looks like the award winning quilt! Of course she thought to make mine in a proper colour (OK non colour then) black. I will get a photo of it as soon as I have a chance. I bought lots of fabric at the show including the most perfect dragon scales. As soon as I finish the last custoemr quilt which is now on the frame I will be able to load up the backing for the dragon. The pattern has been drawn for me by an artist friend so it is exactly the dragon I wanted. It's currnetly lurking in my longarm room, just waiting to chomp unwary visitors. I am so looking forward to getting on with it, it's huge and I love it already. I'd better get on with this customer quilt then hadn't I.
Oh and my friend who collected his free helicopter ride is out of hosptal and doing well. Thanks for all the good wishes. It's been an eventful weekend. Trogdor our race car wasn't ready to race this weekend, so Joker stood in for him again. Saturday she and Tet couldn't quite get it together and they were last after qualifying. So Sunday morning we stood at the start line for round one talking to Spencer and discussing how it wasn't going to be so bad going out first round. We didn't want to be standing around in the sun all day and Spencer had lots of other cars he was crewing for. When we stood there again Sunday evening after the trophy presentation we agreed this must be the way towin race meetings, have agood reason to go out early :) Spencer came first Tet and Joker took the second place. Thrilled? You bet. We made it home OK then found out we were in demand. Unfortunately one of our friends has claimed a free helicopter ride. He was involved in a crash with his trike and was airlifted to a specialist center. It sounds like he is doing OK, and the trike is safe, but it isn't really what we want.He isn't even one of our friends who would have likes a helicopter ride. So it seems a good time to mention that the UK air ambulances are a charity. They fly beause people and businesses donate to them. You really never know when you or someone close to you will need their services, so how about making a donation now while you think about it. There is a web site for all of the air ambulance services in the UK here. If you click on your local helicopter it will give you the web site to donate to them directly. I am sure other countries will have thier own versions of this service and are probably also in need of funds. It isn't cheap to keep a helicopter flying but it can save lives where no other transport could. A lot of people have been asking me how the joker quilt came about. So I thought I would try and explain. Be warned it isn't a straight line design process, that isn't how I work. I should also mention this was designed entirely in my head on a car journey, so there aren't even any sketches of how it grew. Sorry, but how else do you kill a couple of hours on the motorway. It started with the idea to make a bed quilt to fill a particular space in the gallery at the NEC, I also had someone in mind who might be interested in a quilt and I figured I could kill two birds with one stone. As it was a bed quilt it needed to be durable, and that rules out my art quilt techniques (great for the wall but won't handle cats) and using cotton sateen (same problem with felines). We fairly quickly homed in on the idea of playing cards. That straight away brings in another problem though. King size beds need quilts that are either squareish or wider than they are tall. Neither of those work well for a playing card (or that was my thinking at the time). For a while I got detoured onto what borders might work with a large playing card. I wasn't terribly happy with any of the ideas I came up with but the best was a row of card trick blocks on either side of the playing card. If I was going to do that I felt I would need a narrow border to separate the two areas, probably densely quilted (to bridge the gap between the quilted design and the piecing). Some poker chips have an edge pattern of the four card suits and I thought that might do, maybe quilting the area that wasn't them in red on the background? So I had a rough layout then to decide which card. 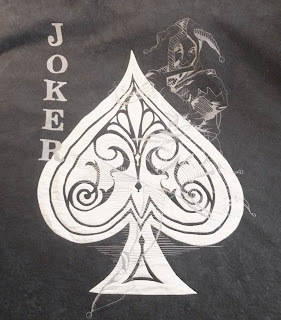 For a rock fan (or indeed a fan of playing cards) the ace of spades has to be an obvious choice, but on the other hand I quite like jokers too. Hmmm, two cards could that work. Well as I said I can't use the applique technique from wall quilts on a bed quilt so how can I get an intricate design onto the quilt? With thread, which was what I had (and still have) planned for a couple of other quilts I will be doing. Great, we are nearly to a plan. Then I remember. I don't like working on white, and I don't think it is a terrible practical colour for bed quilts either. Playing cards (especially the aces) are usually largely white. Hmm....... Invert the colours. Less white. That is pretty much what I carried around in my head waiting to be made. As you can see it didn't quite come out like that. I like to make bed quilts somewhere around 90" tall (top to bottom of the bed). It seems to provide good coverage for a range of beds. From some quick layouts I figured I needed the center spade to be about half that height and the joker a little taller. I produced the full size images of those then laid them on my bed. I realised about that point that I didn't need borders. If I just made the card square it would look fine, and I would have the simplicity of design I had started off wanting. Back to plan one and off I went. The result you've already seen. I find this a lot. I kick designs around until I think I have them. They then live in my head for a while (months to years). Some do come out exactly as they were planned. 'Miss Baltimore' and 'Golden Storm' were both pretty exactly what I have in my head. Others like this one make last minute changes. Tow more of my NEC quilts have done the same thing. Usually it is the ones where I have had to compromise in a way I didn't really like (I really didn't want a border on this quilt) or where I have tried to deviate from what I do. There seems to be a general shape to how I work and design things. I never intended it to be that way, it's just happened. However when I plan to not do it my way things happen. Eventually what I produce comes out looking like one of my quilts. It's quite and odd feeling actually. Having a style that enforces itself when you aren't expecting it. Sometimes it does let me do something different, but only when it is really different it seems. There you go, the mad way inspiration strikes and evolves in to a quilt. This has taken far longer than I would have hoped but it's finally off the frame. I can't recommend pulling the muscles around your ribs if you want to be able to freehand quilt. Still by plugging away a little at the time it's done and I am quite pleased with it. It could do with blocking really as it has a lot of dense quilting, but I haven't anywhere to do that. I am going to try letting it hang for a few days starting from damp and see how that works. I think one of the problems is it still have some wash away stabiliser in it so it's a bit stiff in some places. I've just draped it over my bed pillows and all but I think you can see the general idea of it. The white areas are cutaway applique. I don't like putting white over black as it tends to come up grey so I thought it would be better to put the black over the white. I worked pretty well I think. It also meant I needed to use pale wadding rather than black for this quilt. I would have felt safer with black but I really wanted sharp white. 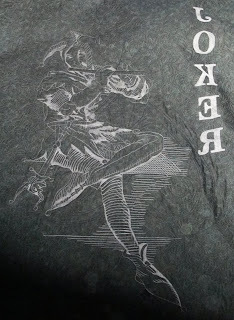 The figure is entirely in thread as are the letters. You can see the figure better on the back of the quilt (second image) it's about 60" head to toe. I love the effect of the stitching, but it is very hard work to do. I'm not to fond of making all those freehand zigzags. Still as proof on concept it's come out very nicely. As I said this quilt will only ever be at one show. The Festival of Quilts, England 2009. So if you do want to see it in the cloth that's where you will need to be. I can assure you there will be a range of new and odd (if not interesting) pieces from me and I am sure many other artists will be slaving away as speak to fill the show with the best work around. I'm really looking forward to having the gallery to be able to show a whole collection of work. The problem is I have more ideas than I can possibly make in time. I keep trying to tell myself there will be more shows in future, but I want it all and I want it now :) Some things will never change. I will now take a break from my work to do a few customer quilts then I will be back at another mammoth piece. I really should learn to work small. I often here people classifying my type of quilting. It doesn't really worry me what answers they come up with, I am going to do what I do, but I have wondered where I would put myself. Am I traditional? Maybe and art quilter? Perhaps contemporary (isn't everyone who is making work now technically?). I think I finally have my answer and it's been brought home to me by the two magazines that arrived this morning. 'American Quilter' and 'Quilting Arts' have both turned up together, and as I am trying to be quiet so I will definitely hear the door I had a look through them both. Back to back it becomes very clear to me that one will not be renewed, because it doesn't inspire me. However I think many people would be surprised to find it is 'Quilting Arts' that just leaves me cold. I don't get most art quilts. They don't talk to me. I don't want to paint on my fabric, I like painting with fabric. I guess I use fabric to get away from traditional art materials where a lot of people are bringing the materials into quilting. I could see me ripping and burning fabric, which would fit in with the sort of work that appears in 'Quilting Arts' but I wouldn't be looking for the end results that would fit. 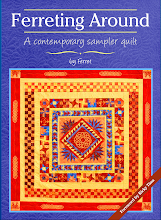 On the other hand I've loved this issue of 'American Quilter'. I am amused by the two black wholecloths in the Paducah show, I just wish I had had time to put one of mine in. I like the idea of quilting on vintage linen. I even fancy making something like the pattern in there. I understand the quilts it shows (and there are a range from very traditional to some lovely art quilts) and many of them inspire me. Will you recognise the inspiration when I've finished with it? I doubt it, but I will know and I will enjoy telling people what prompted my ideas, I love the disbelieving looks. So I would say, I tend to traditional when I comes to quilting. I will stretch it a bit (OK a lot) but I like even my wall quilts to feel and move like fabric. I don't want to work with paper or paint, I might hand dye some of my fabrics, I might even put the dye on with a brush if I need to get a hair or fur texture, but that is as close as I want to come to 'normal' art materials. I love what I do and I know what I love. People to do business with. Recently I've had a few companies impress upon me that I really never want to deal with them again, but today I've had one of the other sort. I've been trying to accept a delivery via City Link. The first day we just got really unlucky, I got back here about 5 minutes after the driver had been. Their lines were busy and head office don't return calls. By the time I tried again (it had said they would call me back) the driver was out of the area and couldn't redeliver until the following day. Importantly they lady I spoke to apologised for no one calling me back and gave me the phone number for the depot so if I needed to get hold of them in future I could. The next day I passed on all my out of the house jobs to other people and waited. I didn't listen to my audio books, I turned the longarm right down to keep it quite, and I opened all the doors between me and the front door. I missed the driver. Hmmm. He claims he had knocked for 10 minutes? I have a door bell which was working and yes he used that too. He tried my neighbours but they were all out (odd I could hear them talking through the walls over the sound of my machine. I called the depot and explained all this to them. They were again appologetic and arranged a morning delivery for today as I have a lot of booking this week and can't sit arround waiting for a package. This morning there was a delicate rattle at the door, but I heard it, and ran for the door. The driver had almost made it back to his van, but I caught him. He asked if I was expecting a delivery? Um, yes that's why you're here. After a long rummage in his van he came back to tell us he hadn't got my delivery. Ah, maybe that is why he was so keen to leave the door. I called the depot again. Once again they were sympathetic and polite. They had to call the driver and check the story with him (yes he really had just not loaded it) and assured me they would call me back. So why with this sort of story do I say these are good people to do business with? It's doesn't sound great does it. Well they called back, as promised. The first thing they said was we messed up, and we're sorry. Followed by, we've put your packages on another van and it should still get to you by 12. That is how you deal with getting it wrong, you put it right. I have huge respect for any business that can put it's hands up, admit a blunder and fix it. Lets face it, things do go wrong, no matter how hard you try to avoid it, when it does you do what you can to keep the customer happy. The companies I don't go back to are those who blame the customer unfairly, who don't apologise and who don't put it right. So if you are in the UK and need an courier consider City Link, they may not be perfect but they will go the extra mile to sort things out.